Any material at the nanoscale is a nanoparticle. Buckyballs, also called fullerenes, were one of the first nanoparticles discovered. This discovery happened in 1985 by a trio of researchers working out of Rice University named Richard Smalley, Harry Kroto, and Robert Curl. Buckyballs are composed of carbon atoms linked to three other carbon atoms by covalent bonds. 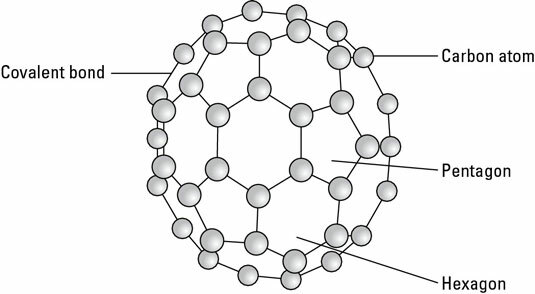 However, the carbon atoms are connected in the same pattern of hexagons and pentagons you find on a soccer ball, giving a buckyball the spherical structure. The most common buckyball contains 60 carbon atoms and is sometimes called C60. Other sizes of buckyballs range from those containing 20 carbon atoms to those containing more than 100 carbon atoms. The versatility of carbon makes carbon-based nanomaterials especially useful to nanotechnologists. This could be because carbon atoms form very strong covalent bonds, bonds in which atoms share electrons with each other. In fact, the world’s most popular bling, diamond, is one of the toughest materials known and is made up entirely of carbon atoms. In a diamond, each carbon atom is covalently bonded to four other carbon atoms in a three-dimensional lattice that makes it very strong indeed. Each carbon atom bonds to four other carbon atoms to form a diamond. 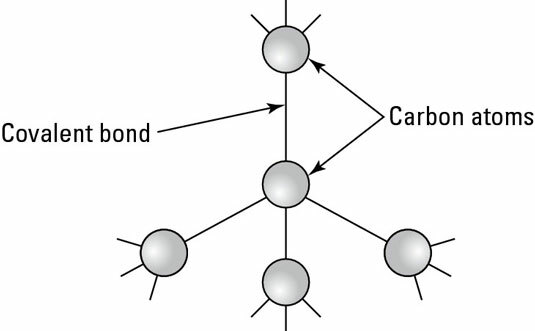 Carbon atoms are also very versatile, in that they can form covalent bonds to many other types of atoms, resulting in the formation of many other materials. Molecules that make up materials ranging from wood to the cells in our bodies are composed of carbon atoms covalently bonded with other types of atoms, which give those molecules different properties. The covalent bonds between carbon atoms make buckyballs very strong, and the carbon atoms readily form covalent bonds with a variety of other atoms. Buckyballs are used in composites to strengthen material. Buckyballs have the interesting electrical property of being very good electron acceptors, which means they accept loose electrons from other materials. This feature is useful, for example, in increasing the efficiency of solar cells in transforming sunlight into electricity.